There are many benefits for those women who spend time choosing the best pair of work boots. In order make things easier I took my time to investigate what work boots were, indeed, the best for them. Well, if you get the right pair of work boots for women you will get comfortable attributes that will completely erase the former issues. In fact, the boots will have shock absorbing and ergonomic features that will be responsible for taking care of the impact that your feet and joints receive for having to stand and walk all day long in hard surfaces. As a result, these parts of your body will thank you for the rest of your life! Most work boots nowadays are made for men. I mean, this is understandable, but really, one goddamn brand could make a pair of work boots that brings together all the features a woman needs on top of a beautiful design, right? Well, to my surprise, there are a few specific brands that achieved this. 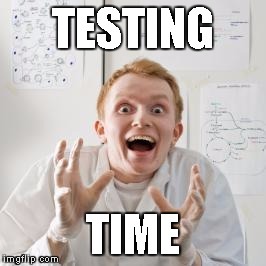 No more frustration… finally! So, I did my best to find work boots that were stylish, protective and designed to satisfy the needs of all women. Women are exposed to the same risks that men are at their jobs. The industry is very dangerous, which is why women need boots that have the needed characteristics to protect them from these issues. Otherwise, they could be exposed to nasty injuries at the worksite. The work boots I found have all the necessary protective features to keep women safe from these injuries. With attributes such as safety steel toes and non-slippery outsoles, these boots will protect any woman that wants to excel at their jobs! In terms of work boots, both men and women have the exact same problem. And that problem is durability. Sadly, many of these boots don’t last as long as they should, especially if you take into consideration their price (which is more than 200 dollars in some cases). + I mean, most boots get wrecked after no more than 4 months of heavy use! So.. what did I do to solve this problem? Well, I looked for work boots with great materials which were manufactured following reliable construction methods which gave me the guarantee that they were going to last at least a few years, even after being heavily used. Most brands don’t take ergonomics into consideration when designing work boots. In fact, most of them make boots with tough and stiff materials which take too long to break in, when they do. As a result, this brings excruciating feet and joint pain to women when they should be focusing on other stuff. This issue is aggravated by the fact that women have to frequently walk or stand on their feet for long hours on hard surfaces. This directly drives pressure to their joints which provokes even more painful agony. The thing is that most workers are men. 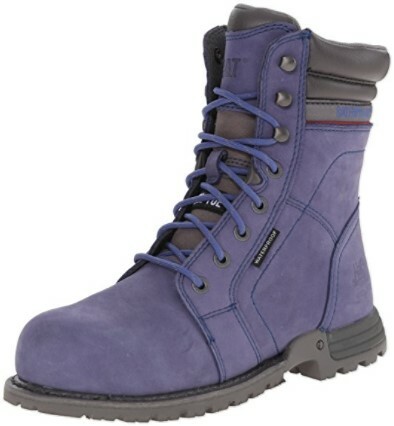 This generates that the whole market of work boots is aimed to solve the necessities of this gender. Correspondingly, brands focus their efforts on making the best work boots for men and not for women, leaving this group on their own. That’s sad, isn’t it? To make things worse, the boots marketed for women end up being really ugly, uncomfortable and not protective at all! This issue is present both for men and women. I mean, if you work at a construction site you’ll fear for your well being no matter what type of gender you are, right? Things are sketchy at the construction site. You could find a slippery surface where you should walk on where, if you don’t have the proper work boots, you could easily fall and injure yourself! Also, there are many other risks at the construction site such as heavy objects that could fall on your feet and toes at any time, leaving them completely crushed. And, if you don’t have work boots with safety toes to protect them, you’ll have to say goodbye to them in some cases! The surprising thing is that there are fewer and fewer brands that seem to know about this. Which is why you’ll find just a handful of work boots for women that gather all these attributes in one pair of work boots. Most women that work in the construction industry complain about the sad level of quality most work boots that are made for women have. And they are frustratingly right, I mean, those are manufactured following lousy construction methods, using cheap materials, which makes footwear that doesn’t last more than 6 months. Hopefully, in this article, I’m gonna show you a couple of tips and a list of boots that will get you closer to finding the best work boots for women. The work boot industry is a men industry. Most brands prefer to use their resources to manufacture work boots aimed to solve the needs of men. This leaves a whole chunk of a market without attention. And, the brands that do decide to go after the women’s market, don’t do it correctly. As a result, women have to choose from many work boots that aren’t as good as they would like them to be. So, in order to provide my fellow women with a solution, I’ll lay down all the features I look for in today’s work boots to find those gems that I know will help my feet to be both comfortable and protected! Most women have to stand or walk for long hours on hard surfaces, like concrete, which puts to much pressure on their feet and joints, provoking unbearable pain. Due to this, a pair of work boots which is going to be used by a woman must have shock absorbing features which will take in that tension preventing it from being delivered to weak parts of the body. Also, you should look for cushioned footbeds for your work boots as these will support the base of your feet in every step. This will keep your feet rested and, more importantly, comfortable throughout the whole work day. The majority of the work boots nowadays are made using really tough materials that make them not only uncomfortable but really difficult to break in, which stretches the time a woman has to deal with that painful discomfort before it’s gone. You ought to look for boots made with a quality leather that’s not only good looking but also easy to break in. See what other people have to say about that specific pair, paying special attention to how long they took to break in. In this way, you’ll have the guarantee that the boots are gonna be comfortable as soon as possible. As the work boot industry focuses only on men, the details of the woman’s feet are left behind when designing a pair of work boots which is supposedly aimed to solve their needs. As a consequence, the boots manufactured are not only ugly but really uncomfortable as they’re not ergonomic at all. You must look for an ergonomic design that adapts to your feet, so seeing what other people have to say about how the boots adapted to their feet is productive. Moreover, you should look for a great combination of attributes that will bring support to your feet and joints. Many brands have proprietary ”Comfort Systems” in which they mix comfortable and supportive features that let women work for long hours standing and walking on rough surfaces without suffering. You should look for work boots that have safety toes like steel toes or composite toes as these are basically protective housings which are incorporated as part of the work boots’ design that stand between the toes and falling objects that could hurt your toes a lot. Women are often exposed to dangerous electrical currents at the construction site. So, in order to keep them safe, they should look for work boots with electrical hazard protection that will block these currents preventing the so feared electrocution. I mean, it’s better to be safe than sorry, right? Most women that work in the construction industry have to frequently walk on slippery surfaces which exposes them to slips and possible injuries. Due to this, women should look for work boots with grippy outsoles that provide grip on these surfaces so they can work with confidence. Women should search for work boots made with high-quality materials that will not only make the boots look good but also will provide them with a base of components that will be able to deal with tough external conditions that could otherwise harm the structure of the boots. Most work boots for women are manufactured following lousy construction methods which makes them get completely wrecked only after a couple of months of use. For this reason, women should look for work boots manufactured following globally recognized construction methods like the ”Goodyear” or ”Cement Heel” construction methods. These will give them the assurance that the boots will hold together under tough conditions. Women, same as men, usually work exposed to tough external conditions. Among these, are being in contact with abrasive substances that could not only harm the boots but also their bodies. So what should they do in order to avoid these risks? Well, in my opinion, women should strive to find work boots that have abrasive resistant materials like outsoles and toe protectors that can keep the boots safe from falling apart by the contact with these substances. How Did I Test The Work Boots? Many of you must be asking how in the hell did she test the boots?. Or maybe you can just wonder about the veracity of this list of the best work boots for women I’m gonna share with you in the following part of the article. To solve all those hesitations I’m gonna explain you exactly how I tested the boots so you can make your own mind if I chose the boots correctly or not. First, I tested the boots shock absorbing features and ergonomic design. For this, I made sure to walk on really hard surfaces for hours and hours. I did this for four consecutive weeks for each pair of work boots. The goal was to see whether the pressure that came with standing and walking on surfaces like concrete was dealt with, and to see also how rested my feet were after a day of hard work. Secondly, I made what I called a ”Break In” test in which I paid close attention to how long it took the boots to break in. And, when I say ”break in”, I’m talking about how the process the boots go through that starts with them stiff out of the box and ends with them ”adapted” to the woman’s feet. First I tested the outsoles. I made sure to walk on the usual slippery surfaces at the construction site where I work. The goal was to find the boots that let me walk on those areas without any hesitation, keeping me safe from slips, falls, and the subsequent injuries that come with these accidents. Then, I tested the safety toes, for this I purposely let heavy objects fall to the toe area to see whether they kept my toes safe or not. I made sure to test the work boots for long periods of time subjected to tough external conditions, like mud, rain, rocky surfaces and abrasive substances. The aim was to see whether the boots could hold their condition without problems. In other words, the goal was to see if the boots were durable or not. Many women are used to working on hard surfaces for long periods of time which puts lots of pressure on their feet and joints. This is why I really appreciated these boots’ removable gel-infused footbeds with memory foam as they cushioned the base of my feet thanks to their memory foam. This material kept the shape of my feet in their structure which provided me with a custom comfort that let my feet rest throughout the whole work day. The boots also helped me to deal with the pressure of working on hard surfaces with their shock absorbing midsoles. These midsoles were incorporated by the engineers at Skechers with the sole goal of blocking the shock from being delivered directly to my feet and joints. Thanks to this, I was able to feel my feet rested at the end of each day that I tested these boots in, which is something that almost never happens! Most work boots are designed to fit in a standard way which is usually uncomfortable for most women. Luckily, the guys at Skechers managed their way to offer this pair of work boots that provided a relaxed fit with a roomy fit that was able to adapt to the shape of my own feet. Something that I really enjoyed as one of the best ways to feel comfortable while working is to use a pair of work boots that fit well. Many surfaces at a construction site are very slippery. This ends up in many women that work in construction falling and injuring themselves. This is why I liked the oil resistant outsoles that these Skechers boots had. They let me walk on slippery surfaces at the construction site as they gave me perfect traction which gave me the confidence to work at my best! There are many falling objects at the construction site that women should be careful of, otherwise, they will surely get injured. This is why I dug the steel safety toes these Skechers boots had as they protected my toes from getting crushed by these falling objects as they acted as a metal barrier placed in between my toes and the exterior. Also, the boots came built with electrical hazard protection which isolated my feet from any electrical currents situated in the exterior environment and around the construction site. This lets me work without the fear of getting electrocuted which let me achieve a great level of performance, something that I’m always after when working. Many work boots fell apart really quickly, and that doesn’t happen because of the quality of the materials but due to other less apparent reasons like the stitching process followed when manufacturing a pair of work boots. If you get work boots made following a lousy stitching process then it will take only a couple of month of medium use to completely wreck them, which is why I fell in love with these Skechers work boots as they were made following a quality stitching process. This method lets the materials hold together in one durable and still piece of footwear that lasts throughout any type of use. 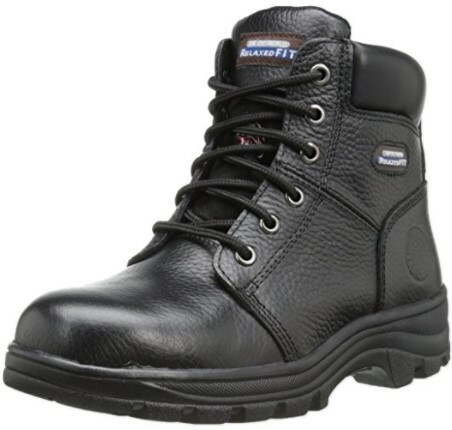 The main material of a pair of work boots is the most important thing for its durability. If you are stuck with work boots made with a low-quality type of leather then they aren’t gonna last long as they will lose their shape and features pretty quickly. This is why I loved these Skechers work boots as they were made with a top-quality leather that deals with any type of hard outdoor conditions I would put it through during the testing period! The boots came with a lace up design that looked really awesome and, also, I could choose to get the boots in black, brown or wheat color. Definitely, a pair of work boots that are protective, comfortable and really good looking which would make any woman happy if she gets it. Features Stitching Accents, Reinforced Stitched Seam Detail, And An Embossed Logo On Side. Side And Heel Leather Overlays For Added Stability. Removable Gel-Infused Footbed With Memory Foam Cushioning For All-Day Comfort. 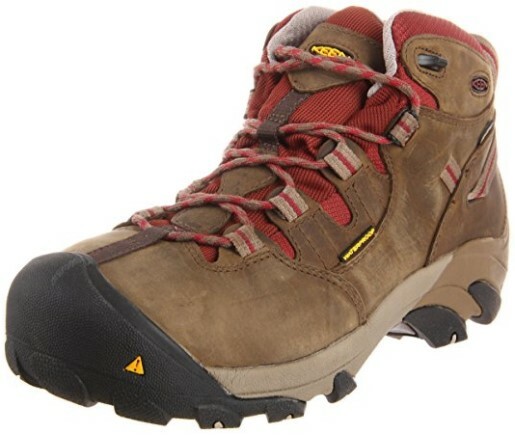 Durable, Oil-Resistant Outsole With Lug Pattern With For Excellent Traction. Steel Safety Toe Meets Astm F2412/2413-2011 I/75 C/75, Eh Standards. Most women have to walk on hard surfaces for long hours, day after day. This puts tremendous pressure on their joints which generated them having all sorts of pain. On that account, these boots came with footbeds were made with PU foam that cushioned my feet, removing any type of pain that could arise at any moment, even when I would have to walk on concrete for 10 hours at a time! 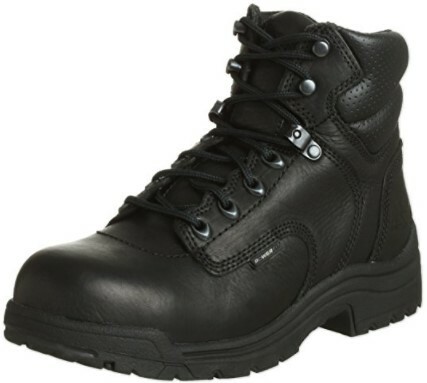 These boots were made of nylon mesh linings that let me achieve an awesome level of comfort while enjoying breathability as the air could flow throughout the boots even when working on those hot and humid days. Shock absorption is essential among women that work in construction as they usually are constantly walking on tough areas which put lots of stress on their knees and other weak joints. The engineers at Caterpillar understood this, which is why they incorporated PVC midsoles that absorbed the stress that standing all day long on concrete would put on any woman’s knees or feet. This let my joints rest and removed the risks of my having to deal with possible pains during the testing period. There are many heavy objects that could fall into a woman’s feet when she’s working at a construction site. Thanks to these Caterpillar work boots’ safety steel toes I was able to work with the highest confidence as I knew that my toes were completely safe thanks to this metal housing that isolated my toes from any risks. There are always live wires hanging around a construction site and women that work there are always at the risk of getting electrocuted. However, if you have work boots manufactured with an electrical hazard protection that is able to deal with up to 600 volts of electricity then you will work with the guarantee of knowing that it’s gonna be hard to suffer that hell! Slipping when walking on slippery surfaces is a common risk among women that work in construction or in other related industries. The good thing is that these Caterpillar work boots came with SRX slip-resistant rubber outsoles that were specifically designed to provide the greatest traction when walking on these slippery surfaces. In terms of durability, the boots came with the so-called T1170 outsoles that performed great while in contact with oil and water as they provided great traction. Moreover, they were built to resist external abrasions which made them be extremely durable. One thing that I really liked about the boots is that they were made following a lace up design that made them to be stylish and feminine, which is one of the reasons why I chose them in the first place to test! Astm F2413-11 I/75 C/75 Steel Toe Protects Against Impact Or Compression. Astm F2413-05 1/75 Eh Electrical Hazard Protection Rated To Protect Against Open Circuits Up To 600 Volts In Dry Conditions. Proprietary Technology Construction For Superior Durability And Comfort. 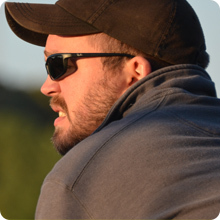 Ergo Technology Engineered To Integrate Stability, Flexibility, And Comfort. Waterproof, Nubuck Leather Uppers Keep Feet Dry And Protected. Nylon Mesh Lining For Added Breathability And Comfort. Nylex Sock Liner Wicks Away Moisture From The Foot To Keep It Dry And Comfortable. Pu Foam Footbed For Cushioning Comfort. Pvc Midsole Provides Shock Absorbance, Support And Strength In Demanding Use Environments. Steel Shank Provides Support And Stability. T1170 Outsole Performs Against Oil, Water And Is Heat And Abrasion Resistant. Srx Best-In-Class, Slip-Resistant Rubber Outsole Reduces The Risk Of Slips And Falls On Low Tractions Surfaces. Working in construction demands from all women to stand and walk on hard surfaces for long hours, sometimes even 10 hours at a time, this puts tremendous stress on their knees and joints. Luckily for us, these Timberland boots came with midsoles made of polyurethane that absorbed the shock that these surfaces put on my knees at the time of testing. This let my joints rest and, for the first time in months, they felt rested instead of dipped in pain at the end of the day. Comfort is vital to achieving a great level of productivity while at the worksite, but, the thing is that most work boots don’t have the necessary elements to bring this level of comfort around. However, these Timberland work boots came with contoured open-cell PU footbeds that cushioned me while at the construction site where I work. In fact, these footbeds were so great that they have the possibility to regulate temperature which lets the feet achieve maximum comfort. Getting your toes crushed by heavy objects that could fall around the construction site must be the worst. On that account, these Timberland work boots came with the famous Titan safety toe caps which acted as a hard barrier that kept my toes safe and isolated from the exterior world, this let me work in confidence without worrying about getting injured! When working, women have to face huge risks like live wires that could put their lives in danger. Luckily for me, these Timberland boots came with electrical hazard protection which isolated my feet from any kind of exterior electrical current that could have put my life in danger during that time! Women face many risks at the construction site. One of those risks is falling while walking on slippery surfaces and getting injured. What I liked about these boots is that they came with Timberland PRO rubber dual-density outsoles that provided me with reliant traction while walking on those sketchy surfaces. This let me not only work with confidence but also avoid really dangerous injuries. The leather is the most important material in a pair of work boots. If the leather used to manufacture them is of a low quality, then the boots won’t last too long. The good news is that these Timberland work boots were made with a quality premium leather that was really tough. I mean, you could even feel the quality by just one quick look at the boots! There are many abrasive substances that could demolish a pair of work boots. Luckily for me, these Timberland work boots came built with abrasion-resistant outsoles that resisted these types of substances which gave me the guarantee that the boots would endure almost any type of external abrasive element that is frequently found at a construction site. What is more stylish than black? Almost nothing. Black is the type of color that can be combined with almost any type of other color around, a pair of blue jeans or a colorful t-shirt. Thankfully these work boots have that stylish black color together with a great feminine design that blows most other work boots out of the water! 6″ Black Premium Full Grain Titan Leather For Comfort. Mesh Comfort Lining With Integral Anti-Microbial Keeps Foot Dry And Comfortable. Heel Insert Provides Durable Cushioning And Energy Return. Titan Safety Toe Cap For Lightweight Protection. Steel Toe Rated Astm F2412-05 And Astm F2413-05 And Electrical Hazard. Constructed On A Women’S Last For Superior Fit. Timberland Pro ™ Rubber Dual-Density Outsole: Slip Resistant, Oil Resistant, And Abrasion Resistant. When you walk or stand on hard surfaces, just like concrete, for long hours (8 or 10-hour work shifts) without any rest, you will want to use a pair of work boots like these Keen work boots. These boots came with metatomical footbeds that ergonomically adapted to my feet, supporting them in every step I took when walking on these tough surfaces. This let my joints and feet rest which multiplied my productivity outputs! Women that work in construction usually have to deal with water in different forms, so, getting work boots that don’t let water come in is always a great idea. This is why I loved these KEEN work boots as they came with a waterproof membrane that kept water from coming inside which gave me the confidence to work at my best as I knew that no water was gonna interfere with my work! Would you like to get your toes and feet crushed by falling objects at the construction site? No? Then getting a pair of these Keen work boots might be the best decision for you then. I support this statement due to the fact that the boots came with safety steel toes that met the highest quality standards which provided me with the assurance that my feet would not get crushed by any tool that could fall as these safety caps functioned as barriers that kept my toes isolated from any exterior risks. Having additional safety measures that will prevent accidents from happening is always a good idea. This is why I liked the reflective webbing that these Keen Utility work boots had as they clearly made me visible when moving around the construction site which prevented possible accidents from happening. A great way to guarantee the durability of a pair of work boots is manufacturing them with quality materials engineered to deal with specific situations that a worker has to cope with. On that account, these Keen Utility work boots came built with a waterproof membrane that assured me that the work boots would not perish even when in contact with water, which usually messes with the leather’s internal fibers that make most of the work boots in the market. In terms of style, I really liked the boots as they came designed with a nice looking leather that felt really good at the touch, together with black outsoles that provided a great combination of colors to use with almost any outfit while at the worksite. Left And Right Asymmetrical Steel Toe That Meets Or Exceeds Astm F2412-11 And F2413-11 I/75 C/75 Eh Standards. Reflective Webbing For Additional Safety. Most women that want to find the best work boots are usually very active people used to be on their feet working on hard surfaces. That is why I think they will enjoy these boots’ comfortable footbeds as, during the testing period, these cushioned the base of my feet in every step I took at the construction site. I mean, it was like I was walking on clouds! Many women have to work walking on slippery surfaces. This can be dangerous as they could slip and fall generating the so-feared injuries. Luckily, these Safety Girl work boots came with non-slipping rubber outsoles that provided me with traction on these risky surfaces during the testing period which let me walk without fearing to get those nasty injuries. There are many risks at the construction site. One of them is getting your toes crushed by heavy objects that could fall on your toes. This is why I loved the safety steel toes that came with these work boots as they provided a metal housing that protected my toes from those objects that could have destroyed my toes if they were to fall on my feet or toes. I hate the frustration that appears when water touches my bare feet, which is why I really liked these Safety Girl work boots as they came built with a water-resistant nubuck leather. This attribute let me work in contact with water which gave me the confidence that no liquids would touch my bare feet. Due to this, I was able to gather the confidence to work without any worries on my mind. The construction process of a pair of work boots is really important. If the boots you get are manufactured following a lousy construction method, then the work boots aren’t gonna last you a lot. 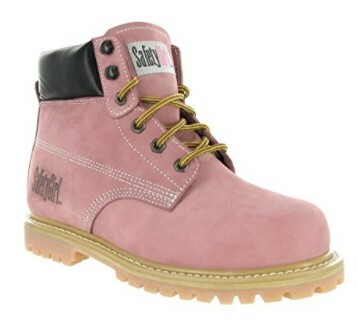 This is why I really liked these Safety Girl work boots because they were made following the Goodyear welt construction method which guarantees that the materials which compose the boots are gonna hold together no matter what type of use you give the boots. There is nothing more feminine that pink, right? I mean, it can be tacky, but I really loved how these work boots looked. I mean, just take look at the pictures! They are so cute that I can’t believe it! These Boots Feature A Nubuck Upper. 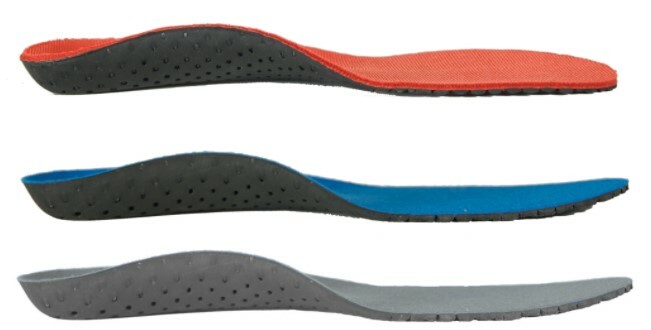 Double Color Rubber Outsole That Grips Onto Surfaces For Full Traction. The Safety Girl Steel Toe Boots Meet Astm F2413-11 I/75 C/75 (2500 Lbs Pressure) To Keep Your Toes Protected From Falling Or Rolling Objects And Equipment. Goodyear Welt Construction And Oil Resistant Outsoles. If you want to know a little bit more about why I chose these boots as the best work boots for women, then click the button down below!